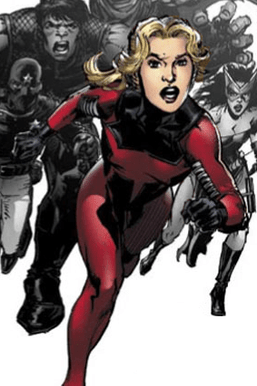 Cassie Lang was introduced to the Marvel Universe as the ill daughter of Scott Lang. Her congenital heart condition forces her father to steal Hank Pym’s Ant-Man equipment and Pym Particles, which he uses to rescue Doctor Sondheim, the only doctor able to cure Cassie’s condition, from Cross Technological Enterprises. After the divorce of her parents, Cassie lives for most of her childhood with her father, whom she loves and admires greatly. She is fascinated by his life as a superhero once she learns of it, and generally has a good relationship with his colleagues; when she was younger, she even called Tony Stark “Uncle Tony.” However, her mother and stepfather fear that his life as an Avenger was unsafe for a child, and they claim custody over Cassie. Scott’s time as an engineer for the Fantastic Four brought Cassie to the team’s then-headquarters of Four Freedoms Plaza. In the spectacular environment Cassie once called home she forged a strong friendship with the former ward of Doctor Doom, Kristoff Vernard. For the time they shared a home with the Fantastic Four, Cassie helped Kristoff adjust to life outside of Doom’s castle, and she developed something of a crush on the boy. After the Fantastic Four went missing and Scott found himself without a job, he took employment at Oracle, Inc. with the Heroes for Hire. It was while working with the Heroes for Hire that Cassie had further adventures, accidentally activating the Super-Adaptoid and receiving horrifying visions of things to come. The Heroes for Hire easily defeated the Adaptoid, and Cassie’s participation in these dark events helped her father and his allies defeat Master of the World in a battle for the fate of the Earth. All of these adventures gave Cassie a taste for the action-filled life of a superhero, but it caused her mother to take sole custody from Scott. As a result of Cassie being kept away from her father Scott, she grew more and more bitter towards her mother, and even more so towards her stepfather, Blake Burdick. As a police officer, he could not stand the world of superheroes the young girl loved, and he unsuccessfully tried to keep Cassie and Scott apart. For years, Cassie visited her father whenever possible, much to her mother and stepfather’s chagrin, until the events of Avengers Disassembled, when Scott Lang was apparently killed due to the actions of an insane Scarlet Witch. Cassie retreated into herself, blaming Blake for being unable to understand her as her father always did. Blake Burdick tried unsuccessfully to be a caring stepfather, being however sometimes distant toward her, seeing his stepdaughter as a “less than brilliant” girl. Sometime after her father’s death, and after another confrontation with her mother and stepfather, Cassie decided to run away to Los Angeles to join the Runaways, but after seeing the “Young Avengers” on television just before leaving, she subsequently changed her plans, as she later told Jessica Jones. After Scott’s death, Cassie began living with her mother and step-father. Tensions were high, and Cassie constantly fought her mother. One night Cassie planned to leave home and join the Runaways. However, that same night Cassie learned about the Young Avengers. Intent on joining them, Cassie sought out Kate Bishop, the young woman rescued by the Young Avengers. Together the pair went to the Avengers Mansion and found the four teen boys called Iron Lad, Patriot, Hulkling and Asgardian. An argument soon erupted about Young Avengers membership, and Cassie began to grow at an alarming rate to everyone’s surprise, including Cassie’s. Captain America, Iron Man and Jessica Jones arrived to quell the argument and help Cassie. While alone in the Avengers Mansion, Cassie confided to Tony that she had been secretly taking Pym Particles for years, and Tony told her the truth about her father’s murder. Not long afterward, the Mansion was attacked by Kang the Conqueror. During the battle both Cassie and Kate joined in, and a brief romance sparked between Cassie and Iron Lad. After defeating Kang and saving the world, Cassie and Kate remained on as permanent members. Captain America and Iron Man ordered the team to disband and refused to train them. However, Kate used some of her family’s money and connections to procure a new lair, costumes and weapons for the team. Although codenames like “Ant-Girl” and “Titan” were suggested, Cassie adopted the title Stature. A few years later, the Young Avengers traveled back in time with an amnesiac Scarlet Witch to the moments before Avengers Mansion was destroyed and escaped along with Lang (leaving the Avengers of that time to believe he had perished). This celebration was short-lived however, after Lang witnessed the death of his daughter Stature in battle with Dr. Doom.Lang had since sworn vengeance on Doom. Soon after the World War Hate, an inversion spell affected the moral axis of numerous super heroes and villains. One of them was Doctor Doom, who became noble, and set out to fix the mistakes of his past. With the help of several heroes he assembled as a team of Avengers, Doom condensed a portion of the inverted Scarlet Witch’s power to manipulate reality into a device in order to right his wrongs, but only had enough power to right one sin and chose to revive Cassie. Cassie was brought back to life, and soon re-encountered her father. Size Reduction: Stature possessed the power to reduce herself to the size of an ant, approximately one-half inch in height. Size Addition: Stature possessed the power to increase size to gigantic heights, requiring the rapid acquisition of body mass (presumably from an extradimensional source). This extra mass fortifies all of her cellular tissue, including her bones and muscles, enabling her to support her increased weight and giving her superhuman strength and durability. The exact limits of Stature’s abilities were not initially determined, but it was later established that she can grow to around 250 feet (76 m) in height (even though she is not able to keep such a size for long before the strain forces her to shrink back down). It appeared to be linked to her emotional state, as her anger has caused her to increase on a few several occasions and guilt caused her to shrink. Hand-to-Hand Combat: She has above-average combat skills from taking self-defense classes, because of how many times she was kidnapped as a child. Initiative Training: She has received militaristic strategies and training during her time with the Initiative. Somewhere between 25 tons and 75 tons. When Cassie grows bigger, her Achilles tendons and nerve clusters grow in proportion, creating large, easy-to-hit targets.